It seems there is a general trend these days for people to try and escape the pompous style of weddings. A wedding can be fun even if you quit the highly elegant style and set it up in an unconventional place. For example, there are plenty of backyard wedding reception or outdoor wedding ideas you can try. Today we will show you a couple of great BBQ wedding ideas if you’re into a cozy reception in your backyard. It’s a great idea to have some accessories suitable for the outdoors. They will please your guests and they can also have a practical role. For example, if the party is going to take place during a long part of the day, you can get some funny sunglasses, sunscreen or hats. They will protect everybody from the sun and heat and you can also choose a certain theme for them. A good (and cheap) idea is to use seasonal blooms as decorations for the tables. Dahlias, garden roses or clematis are perfect for some colorful touches. They will also cost you less, compared to what would you pay for some exotic or out-of-season flowers. And they have the same great effect, so why pay more? Regardless what wedding flowers you choose, it’s important to mix and match them adequately. Using patriotic decorations is one of the best BBQ wedding ideas. Especially if you hold your wedding around the Fourth of July, you can go for the flag. Moreover, it’s a good idea to choose red, white, and blue as the main colors of the wedding. Thankfully, there are plenty of patriotic decorations out there, from lighters to small flags, bow ties or socks. If you’re feeling crafty, you can make your own decorations. If you want to have a fun cocktail hour, make sure you prepare some lawn games before. Some ideas are tic-tac-toe, life-sized Jenga, corn hole or croquet. If it’s a rather small wedding, you can also go for some board games with rewards at the end. Moreover, games are a great ice breaker, so your guests will get to know each other better while also having fun. Colored cocktails are a trademark of summer. Choose the most colored cocktail ideas you can find for a great party. Thankfully, cocktails can be highly customized, so if you don’t like a certain recipe, you can change it to fit your taste. Moreover, you can combine the colors to match the theme of the wedding. If you choose a patriotic one, like suggested above, you can have different red, white, and blue cocktails. 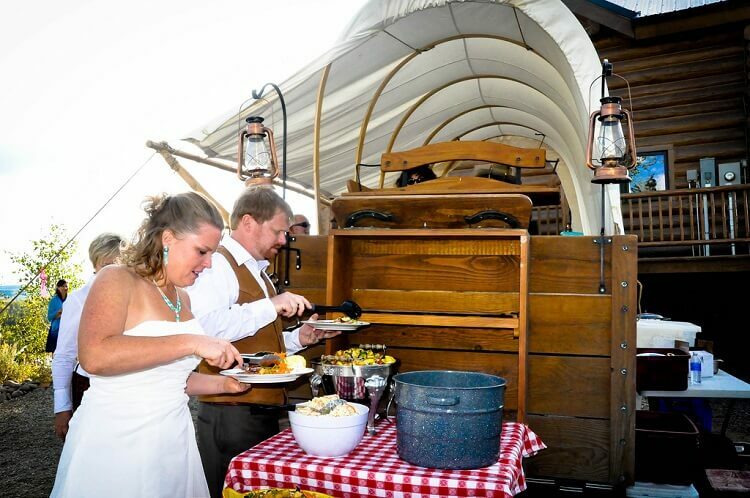 It may sound like one of the most unusual BBQ wedding ideas, but it’s quite useful. If you want to have an authentic picnic experience at your great event, you can’t miss this plaid. Some say it’s not quite appropriate for a wedding, but since it’s a BBQ one, you can go for it. The plaid pattern can also be repeated in various places in the garden or backyard, for a more homogeneous look. Having some refreshments for guests is, again, one of the best BBQ wedding ideas you can have. An outdoor wedding in full summer can prove to be quite unpleasant because of the heat. That’s why you need to prepare a refreshment beyond the alcoholic or fizzy drinks you serve. Try combining cold water with small bites of fruits. Watermelon, peaches or oranges are good ideas. Alternatively, you can freeze some fruits, such as grapes or raspberry, and then place them in glasses. The menu at a BBQ wedding can prove to be rather heavy. As tasty as it may be, it’s good to balance it with some veggies. Whether you serve them as snacks, salads or mixes, don’t forget about the vegetables. For example, some carrot slices can be used for a tasty dip. There is also a variety of vegetable rolls you can cook. If you’re lacking inspiration, try searching for vegan recipes. 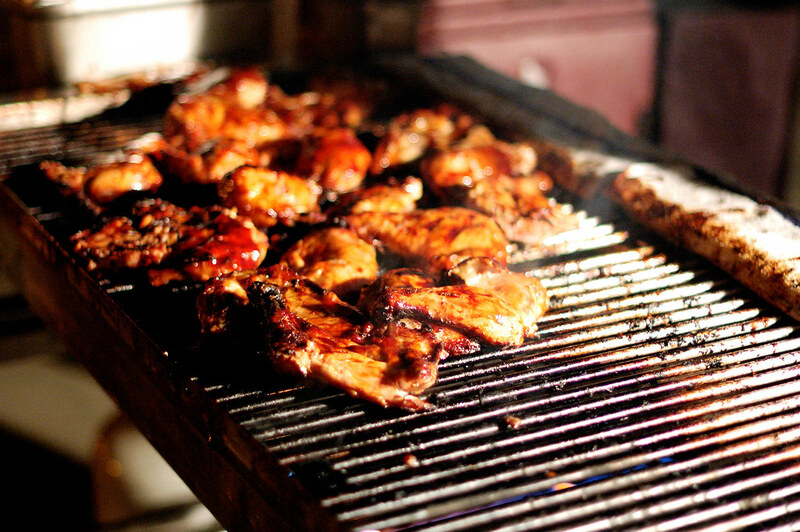 Whether it’s a BBQ wedding or a regular party, we all know the favorite foods. From fried chicken to bacon baskets, these are some tasty options everybody likes. The cool part about it is that it lets you choose a variety of dips for them, thus challenging your creativity. Moreover, you can place your personal touch with the combinations you choose. Avocado, tomatoes or cheese, they’re all great options! Everybody wants to have their refreshments cool. Remember that this is an outdoors event, so most likely it’s going to get hot. Some koozies are a practical idea for keeping the drinks cold all the time. Surely, you know that most people don’t just sit in a place and drink the entire glass. Most of them will start dancing, chatting, playing lawn games or socializing. For this reason, koozies are useful for making them come back to their drinks. One of the essential BBQ wedding ideas is to have beer on tap. If it’s local beer, it’s even better. What BBQ is complete without beer? And having some around can help your guests fight off the heat and refresh themselves. If you’re more creative, you can choose various types of beers and combinations: cherry beers, lemon ones, ginger ale, etc. 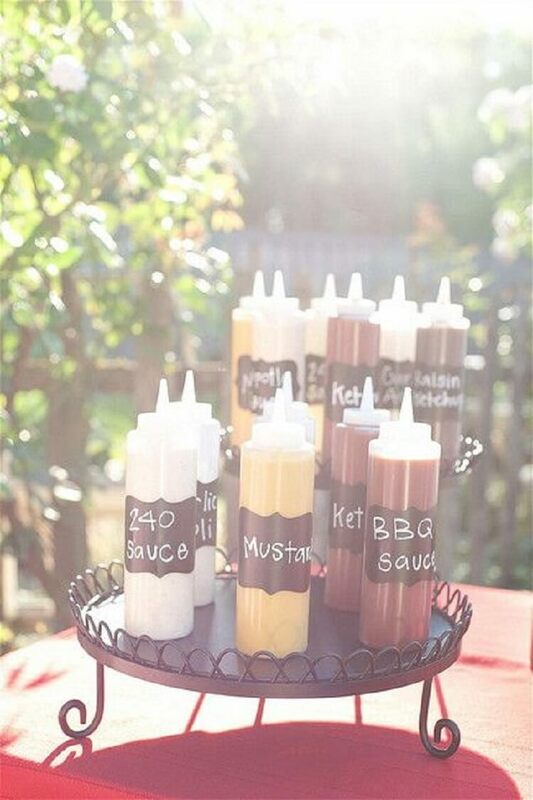 Just as we said, sauces shouldn’t miss from the list of BBQ wedding ideas to use. A sauce and topping stations is an extremely practical idea that can save you time and money. Just like an ice cream machine, your guests can get whatever they want from what’s available. Include ketchup, mustard, BBQ sauce and others, but don’t forget to bring something new as well. Try crazy combinations of mustard with ginger, or various types of sauces. You can also add some sweet ones if you have pancakes or waffles at the table. If you’re having an unconventional BBQ wedding, why not go extra with the foods as well? Choose a dessert or a snack that everybody loves, but they wouldn’t expect it to be on the table at your wedding. Doritos? Kinder? Why not all of them? The limit is only your imagination! And if we’re talking about surprising your guests, wouldn’t pie be also a surprise? Choose some classic flavors, such as apple or pumpkin. Again, you can test your creativity if you know your guests like to taste something new from time to time. However, if you know they’re not big fans of crazy combinations, it’s better to choose safer options instead of wasting food. Is your brother-in-law fan of a certain exotic condiment? Surprise him and the rest of your guests and bring it to the table. You can also bring various herbs and sauces and let your guests make their own custom condiments. The downside of this idea would be that it could cost you quite a lot to buy various types. 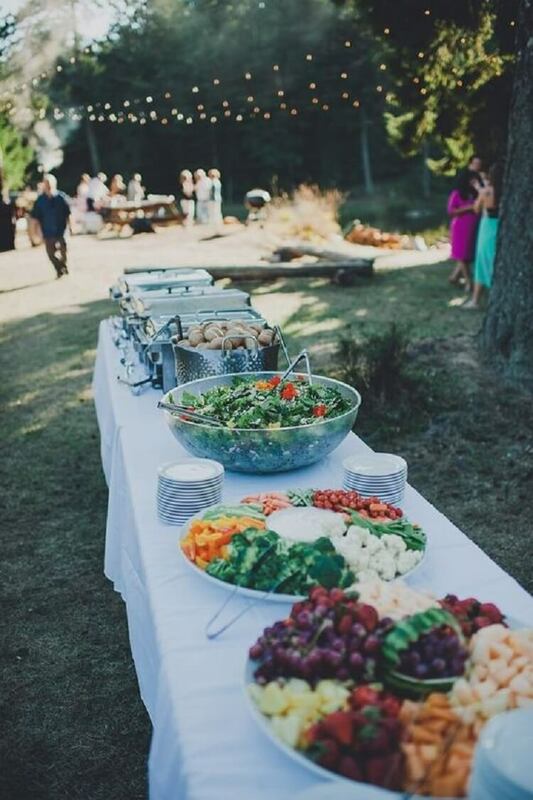 Now that you’ve got some pretty clear ideas about how to decorate and surprise your guests at the BBQ wedding, it’s time to see some menu ideas. If you know you have vegetarian guests, make sure that you include such options on the menu. Go for veggie burgers and hot dogs or place on the side more salads. It’s a good idea to write on the invitation or the wedding website that items on the reception menu. Moreover, you could ask them if they have any special diet requirements, to make sure everything will be okay on the great day. 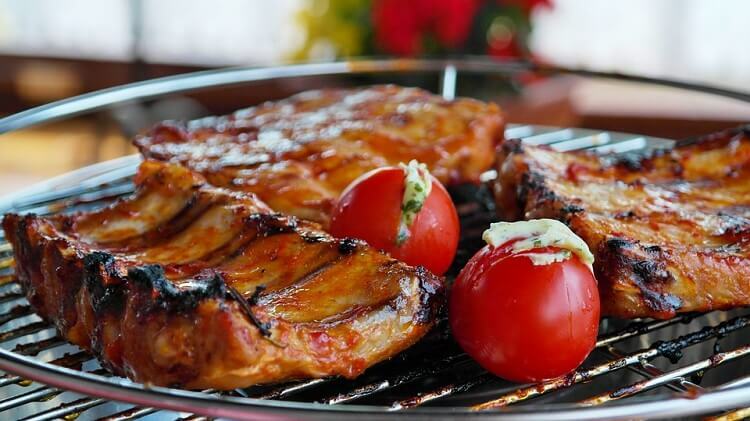 You can go for some traditional side dishes for BBQs, such as corn on the cob or potato salad. However, you can also mix it up with some original dishes, for example, pickled okra, grilled corn with cheese, bacon biscuits etc. It may sound easier to set up than a regular wedding, but a BBQ wedding can turn out to be more complicated. The main idea is that you have more freedom in what concerns the dishes and the decorations since you don’t have to stick to a certain style. But the most important thing is that you should feel good since it’s your big day.